"Probably 20 at the most." EDMONTON - A private group working to help Alberta manage its wild horse population says it will only be able to save up to a third of the animals that could be captured this month. The province wants up to 60 of the feral horses rounded up in an area northwest of Calgary and south of the Red Deer River to keep the size of the herd from growing too large. 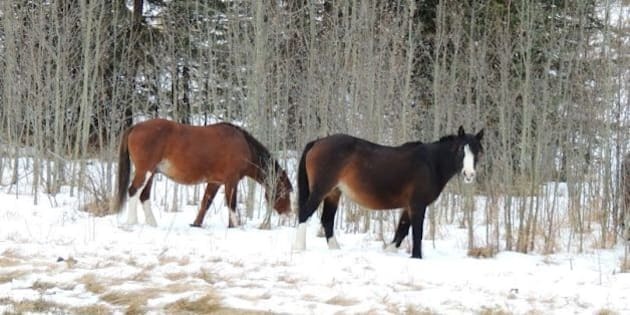 Bob Henderson of the Wild Horses of Alberta Society said that he expects they may be able to put up to 20 of the captured horses up for adoption from its facility near Sundre. "We can or will take as many as we can but we are limited by space and finances. Probably 20 at the most," Henderson said Thursday. "We would love to save them all but we can only do what we can do." Henderson said any horses captured beyond that number, and any of the animals older than two will be sold at auction and likely end up at slaughterhouses for meat. Older wild horses are difficult to "gentle down" and tame, Henderson said. The province estimates there are about 880 feral horses in the Rocky Mountain foothills area and they are damaging grasslands used for livestock grazing and by wildlife such as elk. The government says the horses are not native to Alberta but are descendants of domestic animals used in logging and mining operations in the early 1900s. In November the society signed a five-year contract with the province to help manage the herd. Henderson said they are vaccinating mares in the wild with a contraceptive dart gun that prevents them from conceiving foals for up to three years. The group, which receives no government funding, started the vaccination program a few weeks ago. Progress is slow but steady. So far a team of volunteers have shot 10 mares with barbless vaccine darts that fall out of the horse after delivering the dose of contraceptive. The goal is to vaccinate up to 20 mares this season. Henderson said if their efforts are successful, perhaps the annual feral horse roundups will someday become a thing of the past. "We strongly believe that this is a very effective and humane tool for the government to manage our wild horse population."